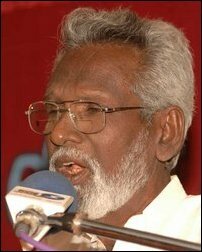 Leader of Liberation Tigers of Tamil Eelam, Velupillai Pirapaharan, Saturday bestowed the title Maamanithar (Great Human being) posthumously on poet Naavannan, Marusaleen Soosainayagam, who passed away on April 15 last year in Vanni at the age of 58. Mr. Pirapaharan honoured the late poet, a Catholic who hailed from Mannar, for his literary contribution to the Tamil struggle. "He used his literary productions to promote vigilance among the people coaxing them to rise against oppression," Mr. Piraphaharan said in the statement conferring the award. 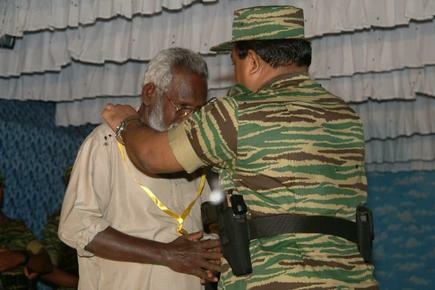 Naavannan, who received awards from the LTTE leader on two earlier occassions for his artistic creations, was honoured Naattup Patraalar (Patriot) last year when he passed away. "One year has gone by since we lost artist Naavannan, a honest, selfless and courageous talented poet, who worked hard for the liberation of our people. "He is a superb poet from our homeland of Tamileelam, a great artist, sculptor and a talented director of plays and dramas. "He was a man of single minded devotion to his art. Creativity flowed through him with abundance. He possessed vast knowledge that amplified his creative talents. "He was passionate about the Tamil language and had a higher ambition of serving the cause of the liberation of his homeland. His personality, which represented a beautiful humanity, gravitated everyone towards him. "He searched for new forms of art, introduced new techniques and produced great works of art in keeping with the changing times and history. "Like him, his productions were beautiful and had literary depth. They had the power to attract and captivate every one. "He used his literary productions to promote vigilance among the people coaxing them to rise against oppression. His works reflect the dimension of the atrocities committed by the Sri Lankan regime in our home land. "As the culmination of his great literary work, he authored a Tamil book, detailing the resurgence of Black Tigers. His great work will be remembered for ever." "In recognition of Poet Naavannan's patriotism and his services to the freedom struggle, I am proud to bestow the national title of honour, the title of Mamanithar, on him. "Death never destroys the great souls who lived their life for truth. They will live for ever in our Nation's soul as heroes of our history."